Globe reporter Mark Arsenault tackles casino development and gambling issues in his frequently updated blog. See what's changed at the site, which first hosted horse racing in 1935 and could end up with one of the state's three resort casino licenses. Should Danvers get a slots parlor? Where should the casinos be located? Big E plan: Are you in favor of it? The five-member state gambling commission voted to approve the proposal by Penn National Gaming, subject to a number of conditions. For the second time in four months, Revere voters have said yes to a casino at Suffolk Downs, approving a $1.3 billion Mohegan Sun proposal at a referendum today, according to city officials. The Massachusetts Gaming Commission says it may have to push back the timetable for awarding the sole eastern Massachusetts resort casino license because of a possible conflict of interest with a contractor that had been helping review surrounding community petitions for casino proposals in Everett and Revere. Private companies are being hired to write regulations and vet casinos, even as the same firms work the other side of the fence, helping casinos enter new markets and sometimes lobbying for their interests. State casino regulators will accept Attorney General Martha Coakleys offer of legal and technical help in writing consumer protection regulations for the issuance of gambling credit by casinos and how those gambling loans are collected. Independent candidate for governor Jeff McCormick said that he supports repealing the states casino law and, if elected, would work to bring Massachusetts income tax rate down to 5 percent by making government run more efficiently. The chairman of Twin River says the casino company is well-positioned to meet the threat of expanded gambling in Massachusetts, with the addition of table games and the acquisition of a resort casino in Mississippi. The Mashpee Wampanoag tribe says it has entered the final stage of its federal land-in-trust request for a proposed casino in Taunton. A federal judge has upheld Massachusetts casino law as constitutional, deciding against a casino developer that had challenged the state statute over its deference to Native American tribes. Mohegan Sun would pay Revere the money under a proposed deal for a gambling resort at the Suffolk Downs racetrack. The deal is expected to go before Revere voters for a referendum vote in about 60 days. Las Vegas gambling giant Caesars Entertainment has filed suit in federal court against Massachusetts gambling commission chairman Stephen Crosby, in part over Crosbys link to a landowner who stands to benefit from an Everett casino project. Boston Mayor-elect Martin J. Walsh says he will not rule out legal action to stop a Mohegan Sun casino at Suffolk Downs from locating in Revere. The state gambling commission said it wants Revere to hold another citywide referendum before the licensing board decides whether the Revere-only Suffolk Downs plan can remain in the competition for the sole Eastern Massachusetts casino license. Governor Deval Patricks administration today filed suit in state court to block the Wampanoag Tribe of Aquinnah from opening a small casino on tribal land on the western edge of Marthas Vineyard. Connecticut gambling giant Mohegan Sun has agreed to join a Suffolk Downs casino bid in Revere, filling a hole created last month when Suffolk Downs dropped Caesars Entertainment from the gambling venture. Federal and state agencies are said to be investigating whether a businessman with a criminal record has ownership in the Everett property where Steve Wynn seeks to build a resort. Town voters emphatically rejected a $1 billion Foxwoods-backed gambling resort on Tuesday, crushing a casino proposal five years in development, and shrinking the field of applicants for the states most lucrative gambling license. The Wampanoag Tribe of Aquinnah said today it has won federal approval to open a casino on tribal land on Marthas Vineyard, introducing a surprising new wrinkle to the states unsettled gambling industry. Suffolk Downs and Revere are looking to modify a casino proposal that would have included East Boston after an Eastie referendum defeated the proposal. The plan to modify the agreement is a sure sign that Suffolk Downs is committed to moving forward. In one swift stunning blow, East Boston voters rejected casino dreams years in the making, defeating a $1 billion Suffolk Downs gambling resort project. Las Vegas casino developer Steve Wynn is withdrawing his application for a casino in Philadelphia, but still has an application in place for a $1.2 billion casino in Everett. Leominster voters strongly endorsed a gambling proposal from Cordish Cos., on Tuesday, completing the field of contestants for the states only slot parlor license. Suffolk Downs would have to generate more gambling revenue than any other casino in the country -- in the Western Hemisphere even -- to reach the $1 billion mark city leaders are counting on under profit-sharing agreements, according to industry experts and a Globe analysis. Cash-flushed casino developers have been bum-rushed out of towns with more affluent populations. Voters dealt a devastating blow to an $800 million Hard Rock casino plan, rejecting the proposal at a referendum and eliminating a prominent competitor for the Western Mass. resort casino license. At issue is whether Las Vegas casino developer Steve Wynn must reach a host community agreement with Boston before he can seek a license from the commission for his proposed casino in Everett. Under a casino host community agreement, Mohegan Sun has agreed to give the town $2.94 million upfront and then annual payments of about $16 million, allowing the gambling company to move ahead to a local vote to pursue a casino license in Western Massachusetts. The casino negotiations between Mayor Menino and Suffolk Downs are done, with the two sides agreeing on a deal that will allow Suffolk Downs gambling resort proposal to move ahead to a referendum vote. Spurned by Tewksbury voters, a Pennsylvania-based gambling company may reemerge in the states slots parlor sweepstakes at Plainridge Racecourse, a one-time favorite to win a slot machine license that fell from the competition when its ownership team was ruled unsuitable to run a casino. Tewksbury closed the door on the $200 million Merrimack Valley Casino proposed for 30 acres of commercial land off Route 133 near the Andover town line. The vote was 995 yes, to 1,568 no. The measure required a 2/3 majority, or 1,709 votes to be adopted. 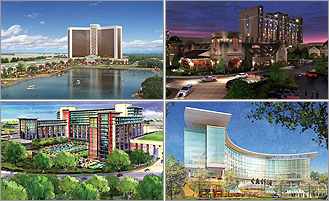 Developers vying for the state's three casino licenses are proposing facilities in a number of locations.